Representatives of the ethanol industry are applauding the U.S. EPA and U.S. DOT for addressing the potential of high-octane fuels in their proposed rule to set new fuel economy and tailpipe greenhouse gas standards for model year 2021-2026 vehicles. Fuel ethanol production capacity in the United States reached more than 16 billion gallons per year, or 1.06 million barrels per day (b/d), at the beginning of 2018, according to EIA's most recent U.S. Fuel Ethanol Plant Production Capacity report. On Aug. 1, Green Plains Inc. released second quarter financial results reporting a year-over-year increase in revenues, reduced net loss and improved performance for its ethanol production segment. On July 31, Archer Daniels Midland Co. released second quarter financial results, reporting strong overall net earnings, but lower results for the bioproducts segments, which includes ethanol. UNICA, the Brazilian sugarcane industry association, has released sugarcane milling and ethanol production data for the first half of July, reporting ethanol production was up 26.24 percent when compared to the same period of last year. Government data released Aug. 3 show that U.S. ethanol exports through June stood at 927.7 million gallons (mg), up 33 percent from the first half of 2017 and on pace to shatter last year’s record of 1.38 billion gallons (bg). Increased global bioethanol use is only a well-constructed policy decision away in markets like Argentina and Chile. The USGC traveled to both countries in June to investigate their existing ethanol markets and discover how to boost demand. Named for the mythical god with two faces, Janus membranes—double-sided membranes that serve as gatekeepers between two substances—have emerged as a material with potential industrial uses, including biofuel production. 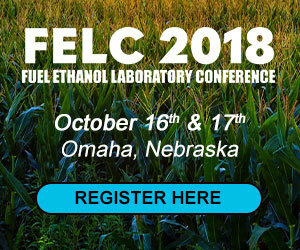 The Renewable Fuels Association, in partnership with Transcaer, International Association of Fire Chiefs, and Pipeline and Hazardous Materials Safety Administration, is hosting an ethanol safety seminar on Aug. 6 in Nashua, New Hampshire. The Renewable Fuels Association has announced that Scott Richman is joining the organization in early August as its chief economist. In this role, Richman will lead the development and execution of a wide range of research and analysis initiatives. Growth Energy has announced Element LLC as its newest member. The addition of the new Colwich, Kansas-based biorefinery marks the 100th plant member for Growth Energy. For the tenth consecutive year, the Renewable Fuels Association is partnering with the Buffalo Chip Campground to host the 78th annual Sturgis Motorcycle Rally, scheduled for Aug. 3-12 in Sturgis, South Dakota. In a global trade environment challenged by tariffs and tensions, emerging markets for grains and ethanol provided a bright spot for U.S. farmers, agribusinesses and industry officials at the USGC's 58th Annual Board of Delegates meeting in Denver. The Renewable Fuels Association and several organizations are hosting ethanol safety seminars in Virginia this week. The events will be held on July 30, July 31 or Aug. 1 in Chesapeake, Virginia.